There was no doubt about it and everybody said it . Since they came to Franklin Township, it was one of the best and the most exciting and fruitful civic and community programs ever. It was the Victory celebration program held at the Holiday Inn , Davidson Avenue, Somerset , New Jersey , for newly-elected Mayor, Dr. Phil Kramer, by the West African Community , last Saturday. It was not only a celebration of the Mayor’s victory in the last November elections; it was also a celebration of the tremendous influence the West African Community in New Jersey now enjoy in the political and socio-cultural renaissance of the State. It was the first time that Africans had taken ownership of any election in the U.S, not only helping a Democratic contestant to win, but now poised to help run the Township. The celebration included impressive speeches by the Mayor, Assemblymen and Councilmen and women, the Police Chief , a Sierra Leonean-born Union County Freeholder, Mr. Mohamed Jalloh ( the son of retired eminent Professor Ben Jalloh ) , distinguished members of the West African Community , its Interim Chairman, Mr. Foday Mansaray and Messrs Dauda Jawara Mansaray and Charles Onyeijika, and of course, Sierra Leone’s Minister Plenipotentiary to the United Nations , Rev. Leeroy Wilfred Kabs-Kanu . There was also indigenous African music played by the African Jazz Band led by a Sierra Leonean of Guinean extraction, Sidique Jabateh, and of course typical African dance , as West Africans and Americans alike took the floor to celebrate the landmark event. Saturday’s celebration was unique in its composition and repertoire of events ‘. Lavish praises for the Mayor’s victory and the growing influence and impact of the West African community were specially reserved for Messrs Foday Mansaray, Dauda Jawara Mansaray and Charles Onyeijika, who spearheaded the Mayor’s campaign and West Africans who did not only work on his campaign team but provided a significant amount of the votes that helped Dr. Phil Kramer win November’s election. Sierra Leoneans, especially felt a sense of pride at the praises poured on Foday Mansaray , in particular , and Dauda Mansaray and others for their civic involvement and and tremendous efforts to help push the community forward . The night’s program was also graced by the giving of the symbolic oath of office by Somerset County Democratic Chairwoman Peg Schaffer. to the new Somerset Prosecutor, American-born Attorney Tina Jalloh, the wife of Professor Ben Jalloh and mother of Freeeholder Mohamed Jalloh. Minister Plenipotentiary Rev. Kabs-Kanu, in his statement, congratulated the Mayor and the elected council man and women on behalf of President Ernest Bai Koroma, who was invited as a special guest to the occasion. Amidst cheers, Minister Kanu said that President Koroma could not attend because he is very busy working to make Sierra Leone a stronger and more progressive country. He told his audience that President Koroma was presently busy marshalling Sierra Leone’s Post-Ebola recovery efforts. However, the President appreciates the invitation accorded him and he thanks the Mayor and Township for the gesture, Mr. Kanu went on. He said that President Koroma also extends thanks to the Mayor for the initiatives he undertook to help alert international attention to the outbreak of Ebola in Sierra Leone. Brief statements were also made by the Presidents of the All People’s Congress ( APC ) and the Sierra Leone People’s Party ( SLPP ) respectively, Messrs Alimamy Turay and Saidu Amara. Mr. Foday Mansaray thanked the West African community for their efforts not only in having the Mayor elected but for helping to push the community forward. He praised many people including Professor Jalloh, Mrs. Mercy Philips, Mr. Charles Onyiajika, Dauda Mansaray etc for their support. He informed the gathering that many West Africans are going to serve in various committees in the township. Sierra Leone’s Information Attache to Saudi Arabia, Mr. Alhaji M.B. Jalloh, who is here on vacation and attended the program, said the event was very good for Sierra Leone and has played a part in the rebranding of the country. He expressed pride at the sight of Sierra Leoneans creating such an impact in the great United States. Added by Editor on January 11, 2016. 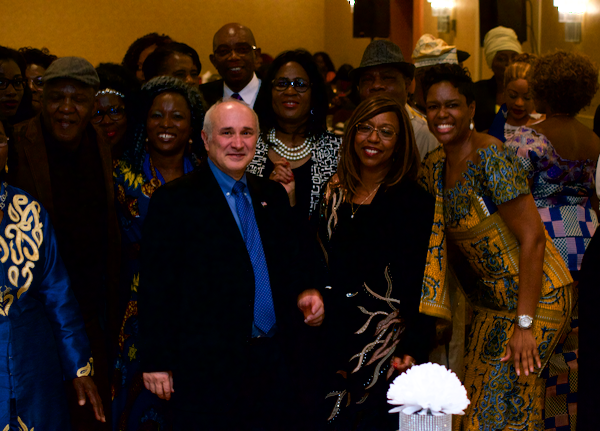 Several hundred members of the township’s West African community gathered Jan. 9 to celebrate their impact in the November 2015 elections. Special guests at the event, held at the Holiday Inn on Davidson Avenue, were the local winners in the election: State Assemblyman Joe Danielsen, (D-17), Mayor Phil Kramer and At-Large Township Council members Shanel Robinson, Kimberly Francois and Rajiv Prasad. Also in attendance were various dignitaries, ranging from the Rev. Leeroy Wilfred Kabs-Kanu, Sierra Leone’s minister plenipotentiary to the United Nations, to Union County Freeholder Mohamed S. Jalloh, to Somerset County Democratic Chairwoman Peg Schaffer. Township Council members James Vassanella (D-Ward 5), Roz Sherman, (D-Ward 2) and Deputy Mayor Ted Chase (D-Ward 1), were also at the event. Throughout the evening, members of the West African community spoke of their growing influence in the township, and of their work to help get the township Democratic slate elected. Kramer thanked the community for their help in his election. Drawing on the immigration experiences of many in the community, Danielsen spoke of his grandfather’s first trip to the United States from Italy. The West African community, like his grandfather, brought to this country “the soul” to contribute to America, he said. Robinson, Francois and Prasad thanked the crowd for their help in winning the election.